Maria Matios (Мария Матиос, 1959) is undoubtedly one of the most best-selling authors in Ukraine. Her work is a perfect "symbiosis of tradition and stylization". 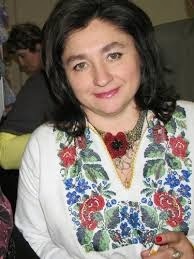 In 2005 she received the T. Shevchenko Award for the novel "Sweet Darusia" (Солодка Даруся). Critics describe M. Matios as the most fruitful and the most hard-working Ukrainian female writer. She offers a reader a vast variety of genres: short-story, "dime novel", pamphlet novel, cookery book, novel saga. As Matios thinks, her reader is a person of a broad intellectual spectrum ("from an academic to a housewife"). This gets proved by the number of copies of her books. The reason for the success, according to several critics, lays in her orientation toward traditional Ukrainian values which get neglected by her colleagues as being "anachronistic". Matios stylizes her prose according to classical canons, however, her works are often described as "pseudo-classical". The main trait of her novels is the exaggerated sentimentality and an inclination toward melodramatic scenes. She looks for a gripping intrigue and emotional tensity. It is Matios who is often in the center of discussions about the phenomenon of popular literature, its antagonism with the "serious literature" and Matios's works are often said to be situated somewhere on the border between the two. Veľmi zaujímavý rozhovor s Mariou Matios z roku 2011, v ktorom sa vyjadruje k politickej situácii na Ukrajine a tiež ako život v Sovietskom zväze ovplyvnil jej tvorbu. Maria Matios sa na Majdane vyjadruje k tomu ako bol milíciou unesený redaktor Igor Lucenko. Článok v ktorom sa bývalý premiér Ukrajiny Mykola Azarov, ešte počas svojej vlády vyjadroval vcelku kriticky na adresu Márii Matios. Začiatkom roka 2015 bude román Márii Matios "Солодка Даруся" preložený do francúzštiny a vydaný vo francúzskom vydavateľstve Gallimard, ktoré je jedným z naj prestížnejších vo Francúzsku. Bude to prvá ukrajinská kniha vydaná v tomto vydavateľstve. Well-known Ukrainian writer Maria Matios will hold a series of readings in Canada where the Ivano-Frankivsk academic music and drama theater readings in Canada where the Ivano-Frankivsk academic music and drama theater will present a play “Solodka Darusya” (“Sweet Darusya”) after Matios’ novel of the will present a play “Solodka Darusya” (“Sweet Darusya”) after Matios’ novel of the same name. This is a short biography of her. Maria Matios started writing in the mid-1970s. At present she is member of the National Writers Union and Ukrainian Writers Association, laureate of the Blahovist literary prize, Volodymyr Batliak prize, and Taras Shevchenko Prize for literature (2005, for the Sweet Darusia novel). She was awarded the title of Ukraine’s Most Prolific Writer. Maria Matios is not only a Ukrainian writer, but also a politician. In 2012, she was elected into Ukrainian Parliament and in 2014 elections she was one of the first members in "The Petro Poroshenko Bloc" election lists. Na tejto stránke si môžete pozrieť politický profil Marie Matios, rating, politická kariéra a aj citáty ktoré sa týkajú politiky. Tu si môžete pozrieť všetky články ktoré sa týkajú politickej kariéry Marie Matios. Preklady diel Marie Matios do ruského jazyka. Viktor Čumak a Mária Matios hovoria vojenským jednotkám o tom aby sa na základe nariadenia parlamentu stiahli z ulíc.